You know what's irritating? Walking through a furniture store and falling in love with a piece of furniture only to flip over the tag and see that it cost three times your monthly salary. When it comes to a dining room table, you want something substantial, especially if it will act as an everyday table and also if you'll be entertaining frequently and/or hosting holiday feasts. Shape and size are also important considerations, and they're not the only ones. A dining room table is not just "a surface to gather around for meals," said Better Homes and Gardens. "Interesting choices in shape, style, and color can make the dining table a substantial piece of furniture that can set the tone for the entire room. But that doesn't mean it has to be expensive. If you're looking for a great table at a price you can handle, here are some great places to look. World Market is a great place to look for stylish furniture at affordable prices. The Wood Durham Extension Dining Table is great looking, goes with almost any decor with its walnut stain, adds a bit of flair with its turned legs, and seats up to 10 with the self-storing leaf. And it's only $349! Prefer a cleaner leg on your table but want a bit of a rustic look? Check out this Carmichael Table from Pier 1. Available in rubbed black, sage, or antique ivory, it's priced at just $359. IKEA may be king when it comes to inexpensive - and some would say disposable - furniture, but the megastore has a variety of tables, chairs, and dining sets for a variety of budgets, and some might last you through several stages of life. The clean lines of the Bjursta table make it a favorite, and it's extendable with two different leaves. The white Henriksdal chairs bring some glam to the space. The whole set with four chairs is just $475. You can also find affordable dining room sets at stores like Macy's, Rooms To Go, and Ashley. This rustic-industrial Freimore Dining Room Table and Stools from Ashley is just $379. Modern minimalism with an Asian flair makes this Madina three-piece dining set a great buy at $899, on sale at Macy's. 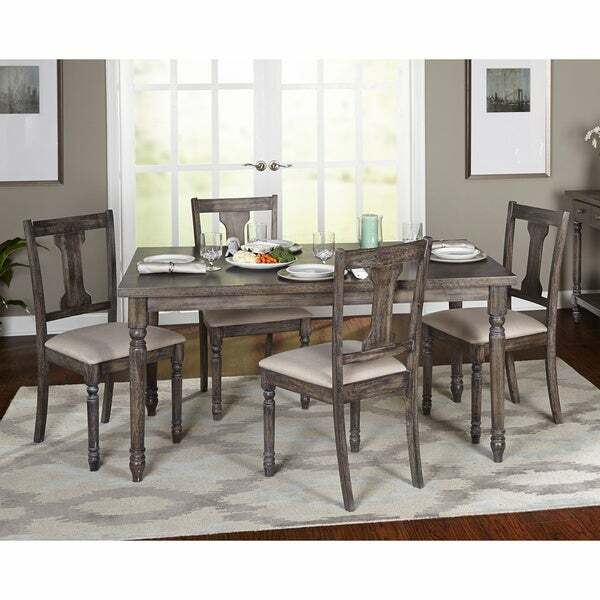 If you're comfortable with buying over the Internet and don't feel like you need to touch, feel, and see the finish in person, you can find some of the deals on sites like Overstock, like this five-piece set that combines a rustic look with a modern gray finish for $600. 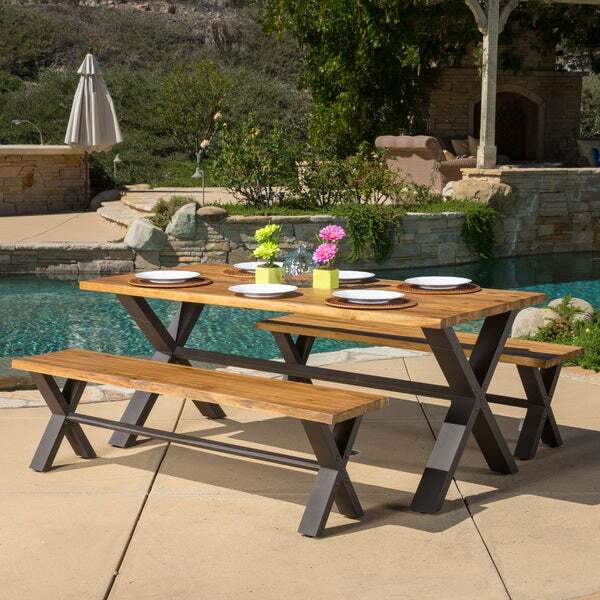 Or this Christopher Knight outdoor set for $643. Wayfair has several different sets at every imaginable price point. We love their extendable tables, perfect for everyday use and for guests. 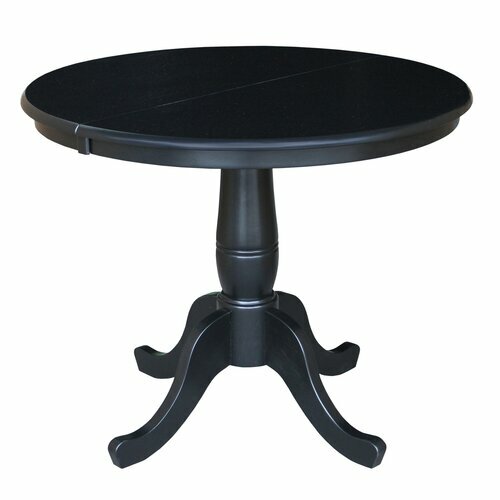 This round pedestal table can easily tuck into a breakfast nook and expand to accommodate guests. Plus, the round style promotes conversation! The Kersey Dining Table brings some mid-century style to your dining room affordably. This table is just $169.